Pallets are commonly used for shipping a wide variety of goods and have done much to revolutionise the transport and handling business. But pallets have a secret other life away from the warehouse and the delivery truck. 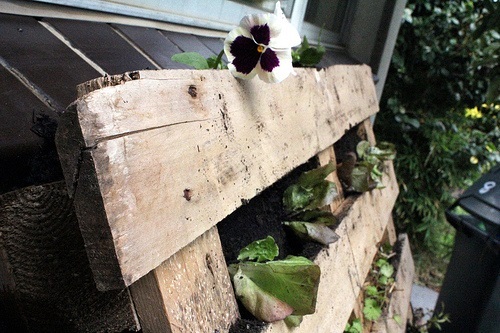 One person’s old pallet is another’s source of material for upcycling. You can buy wooden pallets and turn them into all kinds of useful things, from garden sculptures and planters to useful pieces of furniture. Pallets can even become works of art too, as is being ably demonstrated by a project taking place on the other side of the world. One woman in Australia is using old pallets to create art works and other items. She has set up her own shop to sell the results and, in the process, provided added benefits for the local community. Leona Ryan invites local artists to come and use her facility to promote their work and do workshops, making her business a creative hub in the area known as the Sunshine Coast. The project has led to her receiving orders from other businesses, and as a result they’ve fitted out a number of local cafes with their pallet-built furniture. It’s easy to understand why this is an attractive option: you can buy wooden pallets at low cost, and they make a great basis for upcycling and other projects. Leona has created a pallet workshop called Eliza’s Interactive Gallery which is stocked with the handiwork of Leona herself and that of her woodworker brother Daniel. Between them they dismantle and de-nail ISPM 15 pallets by hand and then sand the wood and rebuild them into a variety of useful objects such as garden planters, tables and bar stools. One of her recent projects is a VW Combi made from old pallets. The wooden van sculpture contains a barbecue and an ice box, and she intends to hire it out to people to use at weddings and other events, further boosting her profile in the local community by attracting attention to her work from locals and tourists alike. If you’re interested in following Leona’s example, pallets as a source of raw material aren’t hard to come by. While you might not want to use new wooden pallets for your projects, there are plenty of places offering used wood pallets for sale, so you should be able to find a low-cost source of them for your project.